Yes, there were only seven of us hardy souls who turned up on a very wet Tuesday morning. A change of plan because of the conditions meant that we headed off down Chorley Old Road towards the Bob Smithy, cutting out High Rid altogether, it was just too wet. We then turned into Walker Fold Road and then across Old Links Golf Course, thought we may have seen David having a swing in the puddles but was not to be. In fact we didn’t pass a soul all the way down to Barrow Bridge where the river was in full flow. Then up the 63 steps and a little stop at the top to get our breath back, and then up the very wet paths to the cottages just before re-joining Walker Fold Road. At the Cottages we decided to have our coffee stop sheltered (I use the term loosely) under a tree. We then crossed the road, admiring the work done by the Woodland Trust on the new car park, and the hundreds of trees they have planted. We continued up the hill and then eventually hitting the Winter Hill Road, which we continued down the hill to Georges Lane. Turning left we entered Wilderswood following it down to the bottom, and eventually turning into Horwich Memorial Park, which is very well looked after with hundreds of trees planted In Memory of loved ones. We eventually went down to the old Arcon Village Estate, which is well finished off now and looking very mature. Eventually we came out at Wallsuches and back to the cars to get our wet clothes off, and into Curley’s for lunch after walking 7.3 miles. A welcome lunch went down well ‘till Richard saw blood running down his finger! Apparently his plate had seen better days and a chip on the corner caught it, but the waitress saw it and rushed over with a plaster. Fortunately it did not affect Richard’s appetite as he swiftly finished off his Fish and Chip’s. 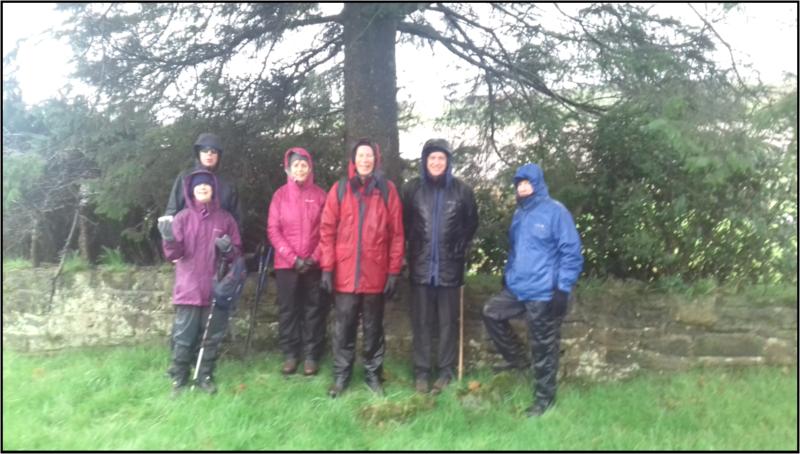 A good walk in wet conditions but we all went home looking forward to our April walk. NEXT WALK: Tuesday 9th April – Guided Tour of Rivington Terraced Gardens with Briony from Groundwork. Meet at the Rivington Bowling Club, Horrobin Ln, Rivington, Bolton BL6 7SE, at 9:45 to start at 10 (parking on the road across the reservoir). Lunch at the Rivington Bowling Club.